Our Danish friends at Cycliciousness drew our attention to a great holiday giving idea this year. Get this: A single $40 donation to UNICEF buys a bike (!) for health workers in developing countries. Help reach parts of many countries that otherwise could be without regular support from health workers. 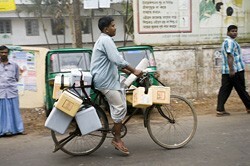 Your purchase will provide a bicycle to help health workers reach vulnerable children in remote communities. Having access to a bicycle for a health worker or midwife can help increase the health standards of children in remote villages and communities in developing countries. A small price to pay for such an important gift! $40 is all it takes to make it happen. $40? That’s like one Car Free Date Night! Hmmm …. beers and a movie, or a bike? That’s an easy choice. For our next date, we’ll just do the car-free part and send the date money to UNICEF. How about you? Can you imagine a better way to share the bike love this holiday season! This entry was posted in bigger than here, bikes, dates and tagged , bike, bikes, christmas, gifts, giving, health, UNICEF, vaccine bike. Bookmark the permalink.